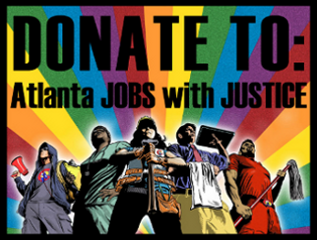 Atlanta Jobs with Justice is standing up with the Atlanta community to free Troy Davis! We only have a week left to make a difference and stop his execution. Troy's execution date is set for September 21st. We must unite and show the Board of Pardons and Paroles that our community will not tolerate the execution of Troy Davis, an innocent man. We need to make it clear to them that there is: TOO MUCH DOUBT TO EXECUTE! This Friday September 16 is an International Day of Solidarity for Troy Davis. In Atlanta there will be a march to free Troy that starts at: 6pm at Woodruff Park, near the intersection at Peachtree and Edgewood. We will march to Ebenezer Baptist Church at 407 Auburn Ave where there will be a prayer service for him at 7pm. 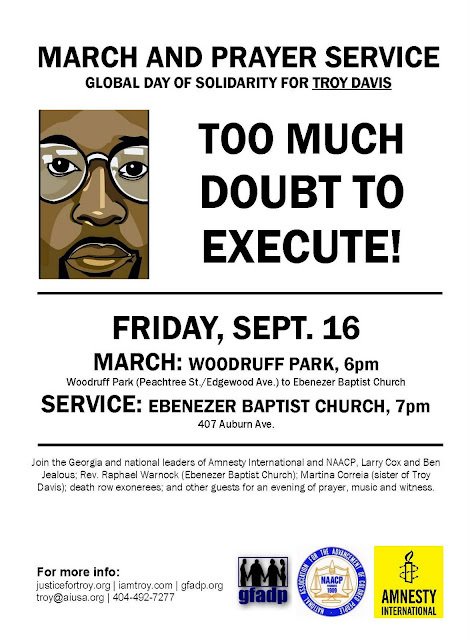 We will join the Georgia and national leaders of Amnesty International and NAACP, Larry Cox and Ben Jealous; Rev. Raphael Warnock (Ebenezer Baptist Church); Martina Correia (sister of Troy Davis); death row exonerees; and other guests for an evening of prayer, music and witness. We will not tolerate the execution of Troy Davis, an innocent man. Verizon Banner Drop and Action.